The easiest way to log a message is to use one of the console.log methods. Note that when using Safari or Chrome to view the logged messages, you must ensure the appropriate filter is set. As shown above, the All filter is set so all logged messages are shown. 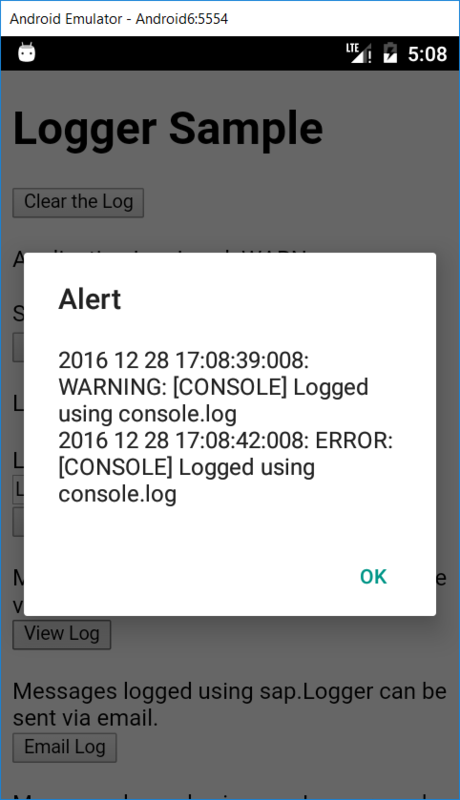 The Kapsel Logger plugin persists the logged messages and enables them to be viewed, emailed, or uploaded from the app. The Logger plugin also has a log level so that only messages logged at that log level or higher are persisted. The log level once set is persistent between application restarts on Android and iOS. 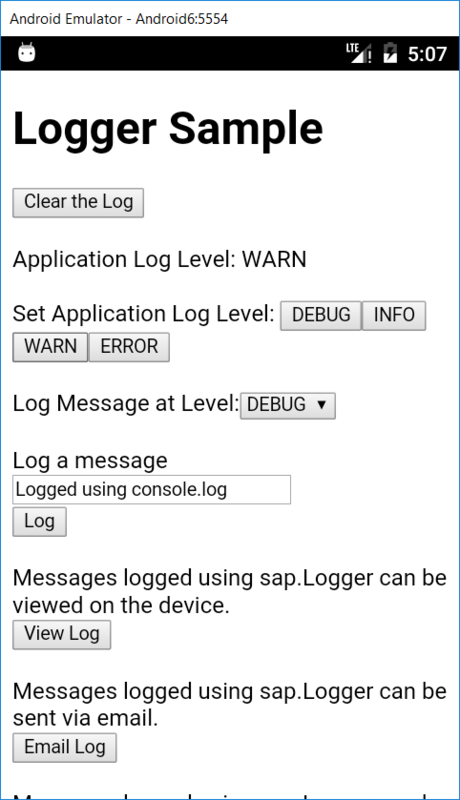 For additional details on the Logger plugin, see C:\SAP\MobileSDK3\KapselSDK\docs\api\sap.Logger.html or Using the Logger Plugin. 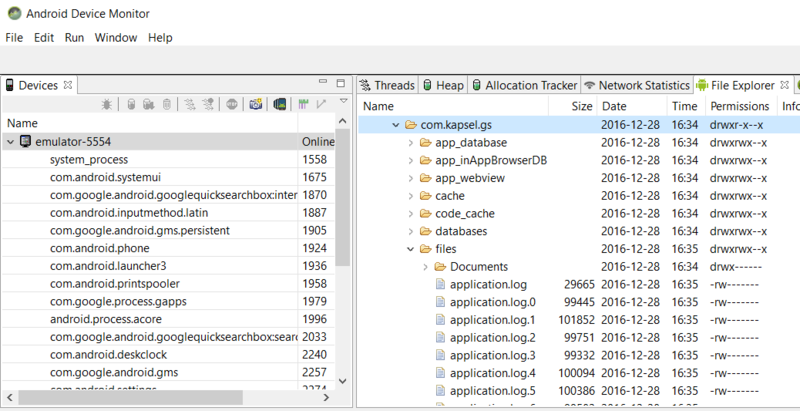 The following application attempts to demonstrate how the Logger plugin can be used. In the folder C:\Kapsel_Projects\KapselGSDemo add the logger plugin. Replace www\index.html with with the following content. Prepare, build and deploy the app with the following command. Notice that the message logged at the debug level does not appear in the log. Pressing the Upload Log button causes the log file to be uploaded to the server. In order for the call to sap.Logger.upload() to succeed, the Log Upload checkbox on the registration ID in the Management Cockpit must be checked. 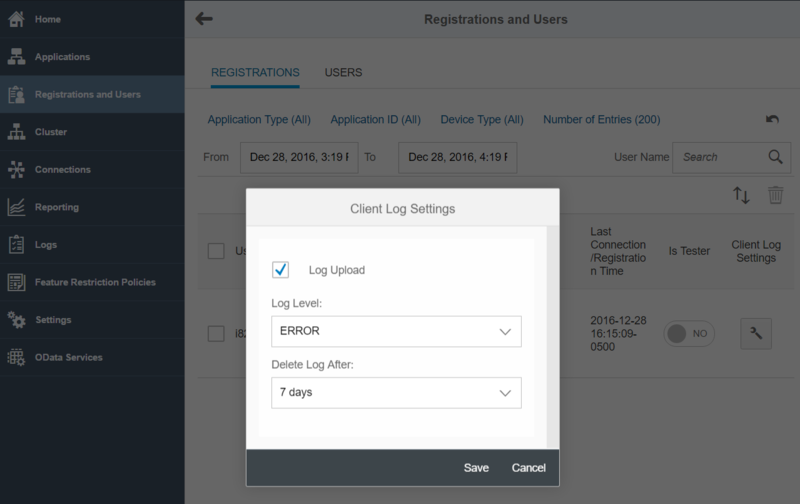 Note, the Log Type drop down in the Client Logging dialog can change the log level set for the application when used with the Settings plugin. A bug has been reported where only the messages that are at the log level specified here or above are uploaded to the server. It is possible to set the Log Upload to be enabled for each new registration via the Application > Configure > Client Policies > Log Policy settings.The log once uploaded to the SMP server can be viewed under Logs > Logs & Traces as shown below. On Android, by default there are 10 log files with a default size of 100KB. When all 10 log files are full, the first log file is erased and then written to. When the log files are uploaded to the SMP server following a call to sap.Logger.upload, the logs on the device are erased. The number of log files and the file size can be set in a properties file. The file_age is in milliseconds. The default shown above is 7 days. After seven days, the logs are erased. The log files can become full quickly so it is recommended to increase these settings. The log files can be viewed on an emulator as shown below under data\data\com.kapsel.gs\files . Note, the Android 7 and 7.1.1 emulators do not appear to enable viewing of files as noted in this bug report. Another way to view the files is to use the following commands.